Last month in Forbes Larry Husten detailed how according to the American College of Cardiology's (ACC) Board of Trustees, Coca-Cola and, "its brand fit with the ACC's goals and values", and later how the ACC has tapped Coca-Cola to pay for ACC branded educational programs for its members. Well guess what? Now the ACC is foisting its love affair with Coca-Cola on young families. 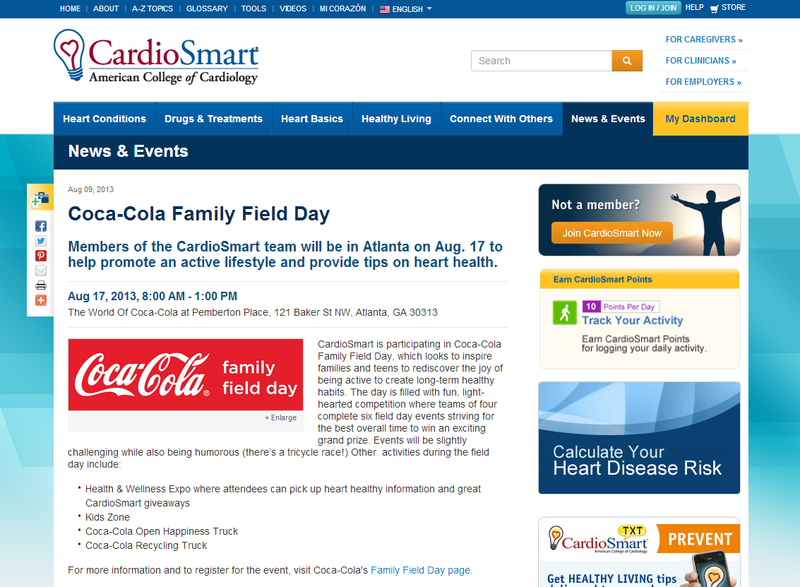 Above is a screen capture from the ACC's Cardio Smart page highlighting their promotion of, "Coca-Cola Family Field Day". 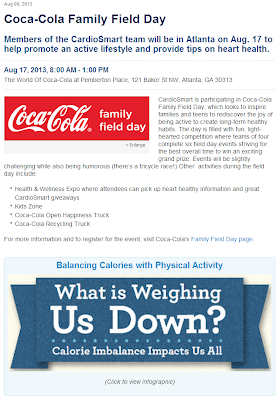 The event description notes a non-surprising focus on physical activity, and also notes that a Coca-Cola Open Happiness Truck will be in attendance. Don't know what an Open Happiness Truck is? Here's a video of one such truck in Asia. 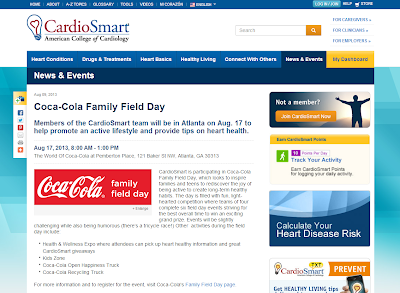 But even if the ACC hosted and promoted event didn't have a truck handing out Coca-Cola to children and tying Coca-Cola's brand and beverages to happiness, sport, and by extension of the ACC's involvement, health, have a peek at what else the ACC is promoting by taking a look at the banner just below the Family Field Day description. "As part of its "Coming Together" campaign, a program that aims to help consumers and their families make smarter choices, Coca-Cola just released a new infographic that blames the obesity epidemic on chicken dishes, bread, and grain-based desserts (while conveniently omitting the fact that the No. 4 source of calories in the standard American diet comes from soda, energy drinks, and sports drinks). The graphic also highlights the old, outdated idea that "calories in" versus "calories out" equals weight loss...while ignoring that not all calories are created equal. After all, 400 calories of pizza or soda is different than a 400-calorie sandwich made from lean turkey, avocado slices, tomatoes, and whole-grain bread." "The infographic gives no guidance about food choices or amounts best for health, but it is quite specific about physical activity. Do lots! Getting active is always good advice, but doesn’t Coke’s phenomenally comprehensive and astronomically expensive marketing offensive have anything to do with food choices? Coke must think all that is irrelevant. I think it’s quite relevant. And so does the research." And so here we have a family day where the ACC actively polishes Coca-Cola's image, is directly involved in the distribution of Coca-Cola's products, and where Coca-Cola's own blatantly self-serving and self-exonerating infographic is being presented to readers as a formal ACC educational aid. So what's going to happen on "Family Field Day"? Probably something akin to what happened on the ACC and Coca-Cola's springtime "Family Track Walk" - a video of which the ACC has posted. Keep your eyes open for the Coca-Cola products (including those being consumed by children) and consider the emotional branding opportunities this collaboration provided Coca-Cola in terms of joy, health, and happiness. Anyone want to take a guess as to why the ACC would partner with Coca-Cola? Yup, dollars, plain and simple. You know I've got nothing against Coca-Cola aggressively promoting its brand, that's the nature of a free market, I just can't fathom how Drs. May and Itchhaporia sleep at night knowing they're leading the ACC, and by extension all of its members, in helping Coca-Cola to do so. Any ACC members there care to weigh in our this? Do the ends justify the means? Would love to hear what you (and everyone else) has to say.